Happy Mardi Gras everyone! My family experienced Mardi Gras for the first time over the weekend and we had a ball. I know some of you are thinking, “You took a family trip to Mardi Gras? Isn’t Mardi Gras just a bunch of drinking and partying? ” Well, yes and no. There is much drinking and partying, but as I learned, the drunkenness that outsiders associate with Mardi Gras is done by the tourists and others who use Mardi Gras as an excuse to practice the phrase “what happens in Mardi Gras stays in Mardi Gras.” Mardi Gras is in fact a family celebration that is steeped in tradition, custom and history. It takes over the entire city and everyone is in a celebratory mood. There is celebrating–food and family parties by locals–and then there is celebrating by tourists (as in getting fall-down drunk) . Because we stayed in a hotel on Canal Street, right downtown and near the French Quarter, we saw the drunken tourists in action. We made the mistake of walking down a few blocks of Bourbon Street at noon and it was full on debauchery. At noon! Can you imagine what it’s like at night? As long as we stayed off Bourbon Street, the French Quarter shops and restaurants were fun to explore . The balconies were decorated and people threw beads to the crowds below. That’s my son in the right corner trying to catch some beads. The floats are amazing to see, but you had better pay attention or you might get beads flung at your head. All the floats have riders that throw beads, cups, stuffed toys and if you’re really lucky, a coconut, to the crowd. This is so much fun and my kids quickly caught on to the phrase, “Throw me something mister!” as they kept their hands up in the air. One time I wasn’t paying attention and two strings of heavy beads clocked my knuckles – ouch! These photos only show about an 1/8 of the beads we have. I think we came home with about 10,000 beads and other throws. What ever will we do with all that Mardi Gras booty? No matter. 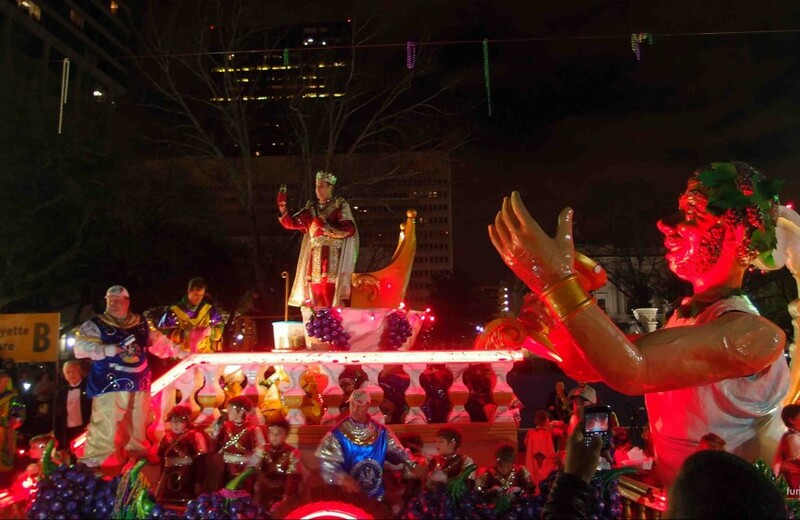 My kids had so much fun; they had never seen anything like Mardi Gras before. Thanks New Orleans for showing us a good time! Happy Mardi Gras! Now I want a beignet! Ha! You guys are all so dang photogenic. Beautiful peeps! Looks like an amazing time. I had no idea Mardi Gras could be family friendly. Your kids are scratching stuff off their life lists left and right and they haven’t even reached majority yet. Good for them!